“I’m looking in your purse for something to gag you with.” Griffin says. “You can’t. I’m really sick. If you gag me, I won’t be able to breathe.” Replies Cheyenne Wilder. 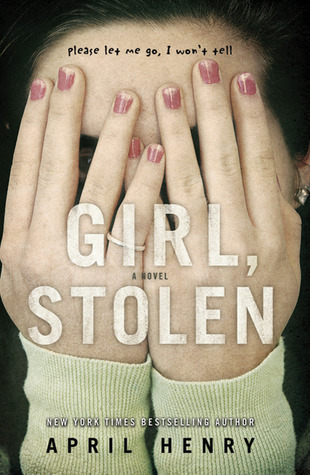 Girl, Stolen is a thrilling mystery, written by the talented author April Henry. The book is about sixteen year old Cheyenne Wilder who is very sick with pneumonia, so her stepmom, Danielle, takes her to the pharmacy to refill a prescription. While she is in the pharmacy Cheyenne is sleeping in the backseat of their car. Griffin spots the car as he is driving into the shopping center. “The Escalade had been a gift, a surprise present meant just for him.” Griffin notices that “no one” is in the Escalade, or is watching it. So, he parks his van on the other side of the center and runs to Cheyenne’s car. He parked his van on the other side to make sure that no one would suspect it was him when his dad went to pick it up. Then, he picks the lock and starts the car, because the keys are already inside of it, and steals it. Cheyenne realizes that it isn’t her stepmom driving. She notices this because she is a very slow driver, whereas Griffin is not even close to being a slow driver let alone a safe one. She then screams. Griffin turns around quickly to realize that there is someone in the car who is not only sick, but Cheyenne is also blind. He doesn’t notice this right away because her eyes are open so it looks like she is staring at him. Griffin hadn’t meant to kidnap Cheyenne, but once his father, Roy, figures out that Cheyenne’s father is the president of the very powerful company, Nike, everything changes. So what are they going to do with her now? Girl, Stolen is a great book. I would recommend it to older audiences, rather than younger. The characters are described vividly and gives you a clear picture of what is going on in each different setting, like when Cheyenne is in the back of the car on the highway with Griffin. The most fascinating character in the book is Cheyenne. She is my favorite character because of the way she is portrayed, blind and sick. It gives you an inside look of what it’s like to live with this disability. The book is a thriller and mystery, and it will leave you off your seat with a cliffhanger after every chapter.